On Friday, July 8, 2011, the 135th and last-ever space shuttle mission, carried out by the shuttle Atlantis, is being launched. What many Americans don’t seem to realize yet is that this effectively marks the end of a half-century of America’s adventure into space which began with John F. Kennedy’s call for America to land men on the Moon in his famous 1961 speech. Since that time NASA carried out the Mercury, Gemini and Apollo programs, the last of which successfully completed 6 astronaut landings on the Moon. 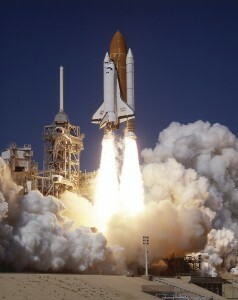 This was followed closely by the shuttle program, which began in 1981 and lasted for 30 years. So after this illustrious record, what’s next? The answer is: nothing. 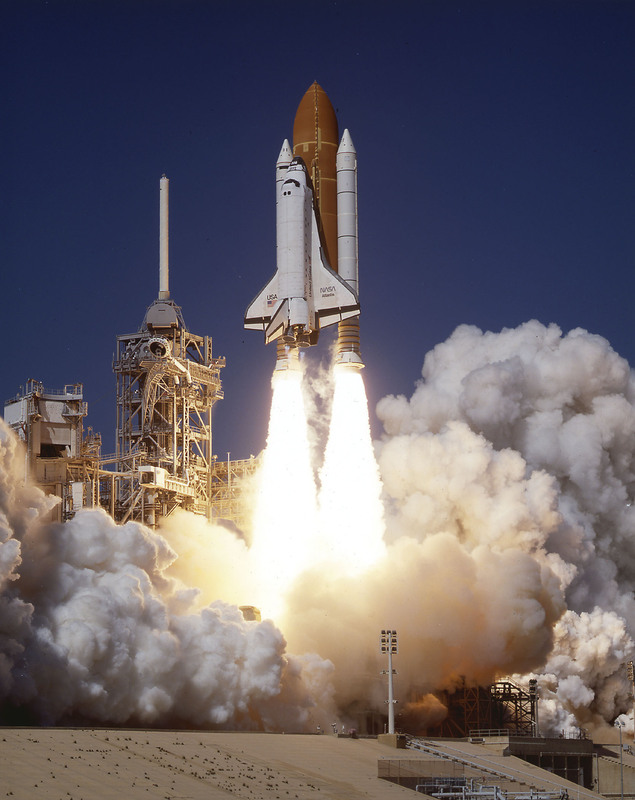 NASA had a Constellation program in development which was intended to replace the shuttle, and which it was hoped would eventually return men to the Moon and perhaps eventually go on to Mars. But last year President Obama declared that the program was hopelessly behind schedule and over-budget, and killed it, over the protests of many of the Apollo astronaut veterans. After all, when you’re engaged in two wars (four these days, counting Libya and Yemen) and trying to create and fund a lot of ambitious social programs while being trillions of dollars in debt, space travel seems a bit extravagant. This means that from now on, if America ever wants or needs to send astronauts into space, such as to the international space station, it will have to hitch a ride with its former competitors, the Russians. (If there is any greater indicator of declining American power and wealth than that, I don’t know what it is.) And the Russians are still using the same old Soyuz rockets that they’ve been building since the 1960s. It makes you think that maybe the U.S. should have kept around a few of its Saturn V rockets from the Apollo days. Not that manned American spaceflight is completely dead. After killing the Constellation project, Obama’s people came up with a plan by which NASA may eventually build some sort of capsule that can be attached to existing commercial satellite launchers, rockets that are built and owned by private companies rather than by NASA itself. So the dream of space travel has officially been privatized. How far off can “Planet Starbucks” be, to quote Fight Club? I can’t get too worked up about the fate of the shuttle itself. Its technology is antiquated by today’s standards. And it was never really inspiring, since all it ever did, and all it was ever capable of doing, was to make short excursions into low-earth orbit and then come home. As an American kid growing up in the 1980s, I remember the shuttle was kind of a bummer after the previous generation had been able to experience the thrill of landing men on the Moon. But still, the shuttle was cool. It could land like a plane rather than splashing down in the ocean as the old space capsules had done. It could be re-used many times, unlike all previous rockets. And it at least showed that we were doing something in space. In the ’80s many of us were convinced that the shuttle was just part of a larger plan to bring the world of 2001: A Space Odyssey into reality, with routine flights to the Moon, manned missions to other planets, and Hiltons in orbit, all within our lifetimes. Looking back after 30 years and 135 missions, it now seems that NASA was just marking time. Atlantis is the end of an era, and an indicator of the dangerous new era that America is entering. Like any healthy civilization, America, since its birth, has always had a motivating myth to inspire its people, westward expansion being the most prominent one. In the 1960s, when American confidence was flagging in the face of apparently unstoppable Soviet expansionism and the ongoing humiliation of the Vietnam War, the goal of landing a man on the Moon helped to inspire Americans. Yes, I’m well aware that the Apollo program was not really about the grandeur of space exploration or the desire to go there “in peace for all mankind,” but was just intended to pay the Soviet Union back for Sputnik. And I think most Americans must have known that at the time. But still, it was exciting, and it was a good reason to do well in school or read a book or care about your country. And as a myth, it continues to be effective — “landing a man on the Moon” has been a rallying cry for defenders of America and Western civilization ever since. While space travel was inspiring to me as a boy, in my adult years other things inspire me now. A great book or a great piece of music, or a spiritually advanced individual, or someone dedicated wholeheartedly to a good cause, mean a lot more to me these days than do astronauts or space flights. I’ve also grown quite negative in my view of America’s role in the world, as well as of science’s ability to solve humanity’s genuine problems (and still more about scientism, or science’s elevation to the same status that rightfully belongs to religion). But in spite of all that, if America landed astronauts on the Moon or Mars, I haven’t grown so cold that it wouldn’t warm my heart. Every great civilization has a motivating myth that gives its citizens a sense of purpose and meaning. And the United States did have that once, even when those myths were occasionally bad ones, such as “making the world safe for democracy.” But what myth can America offer today? The only myths that we have are not those which spark the imagination, one’s enthusiasm and the will, but only those by which America is trying desperately not to lose what it already has, such as the “war on terror,” which is really just a clumsy attempt to reverse America’s declining geopolitical power and grab the last of the cheap oil resources. I really don’t know what inspires young minds today. At the risk of sounding like a young fogey (I’m only 37), perhaps that’s why the younger generation seem so materialistic and self-centered, since there’s never been much in terms of social idealism to capture their imaginations. What can America offer as something to inspire its young people? National health care? Multiculturalism? Imposing democracy by force of arms upon people who don’t want it? Bringing down the deficit? No wonder the young are more interested in worrying about their careers and their bank accounts. I think the most frightening aspect of the end of American manned spaceflight has been the apparent lack of public outcry about it. Either people are ignorant of what’s afoot, or they are simply too jaded or worried about more immediate problems to care. Whatever the case may be, the end of the shuttle program marks the end of the last vestiges of the American myth. I generally tend to shy away from apocalyptic collapse scenarios. Still, it cannot be denied that the United States, while it may continue to coast in some form for decades to come, has already seen its best days. The task now is not to mourn but to construct an alternative which can inspire our people for the age that will come after the American age. And I think we can do better. Published: July 8, 2011 | This entry was posted in North American New Right and tagged America, articles, Barack Obama, John Morgan, myth, North American New Right, originals, space flight, the Space Shuttle, white heroism. Both comments and trackbacks are currently closed. I’ll take Promethean “myths” over a white Bantustan – wherever- any day. We either take it all back, or we lose it all. This is a zero-sum game. The Jews insist. The first “white Bantustan” was America at Plymouth Rock, and Jamestown. The second “white Bantustan” was America under the Articles of Confederation. The third “white Bantustan” was America under the Constitution of 1791. The fourth “white Bantustan” was America under the Constitution of 1933. So far, so good. This deals with the issues Dr. Revilo Oliver deals with in the “History and Biology” thread, and Yockey deals with in “Imperium” – the vertical component of Race. Our downfall began with the Revolution of 1933. In time, the American Revolution was replaced by the French Revolution, and mandated equality of outcomes became the law as defined in Master Sergeant Thomas James Ball’s “Second Set of Books”. The Immigration Reform Act of 1965, and Affirmative Action, worked relentlessly to demonize Western Civilization (but I repeat myself), demoralize Western Man, and remove him from history. The “take it all back” people can’t take back one square foot of South Central, or Chicago’s South Side. They are Charlie Brown’s to a man, who are so inept, so much the tools of Wordism, that they gave away a nation, and their Children’s Future, to the people who make Mogadishu and Mexico City the hellholes they are. I’ve wasted too much of my life trying to make these Losers into effective people. They wallow in their impotence. Want to meet with them and organize? Their car is always “blowing up,” and they take no further initiative to meet after that magical “Get Out Of Adult Responsibility Free” card. They can’t sent twenty dollars a month regularly to counter-currents, or even ten dollars. It’s not that difficult, but that would mean choosing to take back your life, one minute at a time, one dollar at a time. That would get in the way of that case of Bud on the weekend,and we can’t have that. I have an informal challenge that only one person took me up on, and even that was in a most cursory manner. To his credit, that was Mark Hess. Describe what the world looks like outside your bedroom window in 2050, and how it is different, and better, thanks to your efforts on behalf of your Race. After Mark, no one has attempted it, and that is because they are so demoralized – Bezmenov was right – that they are retreating into Brave New World, happy little Gammas with their six-packs, and the Masturbation Channel/NFL Channel/UFC Pay-Per-View package on cable. They can even download and listen to Pierce’s ADV’s. Take back a nation? Hell, they can’t take back Friday night from the Mediacorps, much less send ten dollars a month to counter-currents. Their Ancestors built a nation from nothing but wilderness. They can’t build a life for themselves, and a future for White Children, in the most prosperous nation in the history of the world. It would get in the way of what they are allowed to do. They are still allowed to send money to counter-currents, and should do so regularly. Their dreams of Conquest should start where they are. They can send money to counter-currents, and their neighbors need never know. If, one day, they see how the London of Masterpiece Theater has became the London of Londonistan, and how the flash-mobs and CHAVS have brought Africa to England, and America, they MIGHT, as the last resort, consider making a run to the Northwest Republic. By that time, they won’t be allowed to. Well, they still have cable, and a case of cold ones. “Take Back This Day?” Hell, they won’t take back Friday night. While they can. NASA is an Executive Branch agency. I have little doubt it will remain in name alone, in the very near future. As the American Republic is being liquidated to support the American Empire, so NASA will be liquidated in all but name, with the Smart Guys who used to work there working for the contractors who supply lift vehicles, and satellites. The ISS is simply a better MIR, and has run its lifespan. I suspect the Moon is pretty much off limits, for various reasons. Incidentally, Richard Hoagland (enterprisemission.com) looked at the declassified Soviet space program plans, and laid them alongside ours. He said it looked to him like ONE program, with ONE controlling Mind letting America make one thing, and the Soviets, another. One example – they remain preeminent in heavy lift, with amazingly reliable boosters at Baikonur. We remain the leaders in sensors and satellites. Two nations, One Program, run by former NSDAP scientists. Again, Harbinson’s Book 5, “Resurrection,” offers some useful leading thoughts in this area, as it is, and as it might become. Remember the singular importance of Master Sergeant Thomas James Ball’s “Second Set of Books.” America needs new myths, reflecting the deeper truths our institutional religions are forbidden to even mention, much less discuss. The comprehensive foundry for such myths would be in a Northwest Republic, a nation founded by a Constitution that specifically states it supports one Race, and is designed to protect and serve the Racially Conscious Community. The space program has always been a source of national pride and technological innovation so it’s important that it continues in some form. It exemplifies the Western Faustian spirit to literally reach for the stars. But NASA is in need of an enema. I worked at a major supplier for the Space Shuttle program and a rot has set in at NASA. These day, it’s less of an engineering and scientific meritocracy and more of an experiment in affirmative action with legions of overpaid minority bureaucrats. NASA had only one philosopher, Wernher von Braun. Toward the end of his life, von Braun knew he was dying of cancer and became very contemplative. I happened to hear him speak at a dinner in his honor in San Francisco. He raised the question of what the space program was really all about. From a man on the Moon in 1969, to an ape in the White House in 2009. After all, when you’re engaged in two wars (four these days, counting Libya and Yemen) and trying to create and fund a lot of ambitious social programs while being trillions of dollars in debt, space travel seems a bit extravagant. Ayn Rand wrote of this, noting that the great Apollo Moment – Man on the Moon, and returning safely! – was conterpointed by the great Dionysian Moment, Woodstock. The Children of the Sixties hated America (color television, control of the public indoctrination education system, the moral inversion that dominates America society, all have led to the moment that America’s enemies – the enemies of the White Race, the advocates of the genocide of the White Race – now rejoice in our humbling, and our demise. Shed no tears for a people who rejoice in our genocide. A friend of mine worked very high up in NASA. Two points: One, the Air Force was bitterly opposed to NASA, in general, and the Space Shuttle, in particular. The Air Force gelded the Shuttle specs until it became an LEO truck. Two, the Air Force retains lift capability. The Space Program just became the Military Space Program. No mention of this in the media, of course. Incidentally, Harbinson’s fifth book, “Resurrection,” contains some interesting observations and philosophical observations. I really don’t know what inspires young minds today. Fascinating question. The underclass is “inspired” by greed, envy, and hatred for the good, and the noble. The potential seeds of the Western Awakening are dealing with the developmental issues in cyberspace, the very existence of which has been have been denied by the Owners. Thus, WoW, EVE, and Game of Thrones have their popularity, in part, to a youth that knows Something is profoundly wrong. They do not have the comprehensive answer, yet, but they will, if they get a chance to hear us. I think we are planting seeds that need the scourge of being victimized by a scorched earth policy to begin to germinate, because, at that point, it’s either grow, or die. The only sustainable path to true growth is what the metapolitical project has to offer. Did I mention you can send money to counter-currents? A minor point, but a congenial one: it is no longer appropriate, if it ever was, so confuse “America” with the United States, and especially not to confuse “American” with United States citizen, an arbitrary legal technicality if ever there was one. The United States is a failed state according to the conventional wisdom applied elsewhere. Only the sheer power of the various American mythologies keep it afloat. Soon, even that power source will be exhausted, not unlike the Apollo program exhausted the last generation of Americans before our dispossession by the Huddled Masses of ants come to devour the crumbs from the table. Anyway, I remember a Saturn Ib on pad 39a, part of the Skylab program. Launch would be two days after we were home from our Florida vacation. Pity. But I’m told I did watch Armstrong on television, not that I remember it in the least. Just think about it – the Moon is 238,000 miles from earth. We were able to send men up there four times, play golf, and ride around on Moon Buggies. Then, Nixon is forced to resign, and no one has done anything even remotely similar since. The Space Shuttles never got above 600 miles. 40 years later, and NASA says the technical hurdles are too high to get back to the Moon. Yet back in the 60s we were able to do it easily. Even our modern technology, much advanced since the 1960s, can’t get us back. Truly how far we’ve fallen.